Through IGA Community Chest we’ve raised well over $70m to help local communities. At Supa IGA Russell Island, we love to support local charities. We do not have to look any further than our own community to discover our locals who are involved in fundraising or holding special events on behalf of worthwhile causes. Money for IGA Community Chest is raised through a variety of ways and it is something we do 52 weeks a year. 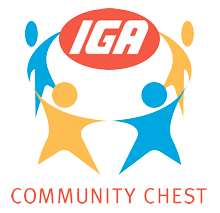 When you purchase a product with the IGA Community Chest logo printed on the label, a percentage is automatically credited to that store’s IGA Community Chest fund. (some exclusions apply) During IGA Community Chest catalogue promotion weeks, all products in the catalogue bearing the special IGA Community Chest logo contribute to the Chest. Throughout the year, extra fundraising activities are conducted by stores and regions. Here are a couple of tips on becoming an IGA Community Chest beneficiary. What support are you looking for – monies, donations of goods, providing team jumpers, holding regular fundraising at the store, group registrations at the store, etc.